The external torx sockets are specially designed to be used with Torx style fasteners commonly found on motorcycles, import vehicles, disc breaks, and electronics. 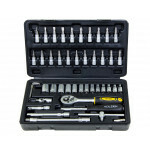 This set contains 13 different sizes spanning from E-4 to E-24 using 1/4 in., 3/8 in. and 1/2 in. drives. The sockets are designed to stand up to the toughest jobs that the weekend DIYer or professional mechanic can throw at them.